Although H1N1 is an airborne pathogen, it’s far more easily transmitted through hand-to-hand contact. This is one more reason it’s important to understand the proper use of antimicrobials and how they fit into your salon sanitation regimen. by Dr. Kenneth Gerenraich, D.P.M. It is important to realize that while H1N1 may be transmitted via the air from sneezes and coughing, it is far more likely to be transmitted by hand-to-hand contact. As a rule of good practice, and a law in almost all states, nail technicians should always wash their hands and their client’s hands prior to beginning a service. Imagine a doctor not washing his hands before touching a patient. However, it’s not just simply about washing hands; it’s the technique and time a person employs while washing that matters. In medical school I learned to sing the “happy birthday” song at the proper speed to determine the length of time to wash. I also learned to wash underneath my nails and between my fingers (both favorite hiding places for germs), and then to dry thoroughly with a clean, dry towel. Once my hands are dry, I use the towel to turn off the water and then use it to open the door to exit the restroom. Touching germs after washing recontaminates the hands before the technician or client even returns to the station or table. While clients and technicians alike should do this before any salon service, unfortunately, in real life it doesn’t happen this way. When proper hand-washing is not readily available, a technician should use a sanitizer to clean her hands and her client’s hands prior to starting the service. 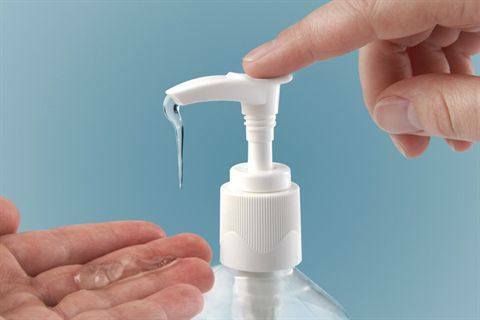 Like hand-washing, it’s how a person uses a sanitizer that makes the difference. Sanitizers only work where they touch. Putting it only on your palms isn’t adequate since the majority of germs are hidden under the nail tips, in the groove on the sides of the nail, and between the fingers. A sanitizer must cover all these locations, and similar to washing with soap and water, the sanitizer must be rubbed on these areas for 15-20 seconds. It’s important to note that hands can be recontaminated during a procedure. If a technician or client sneezes, sanitize again. Evaluating Sanitizers Products that contain provodone iodine, ­alcohol, or benzalkonium chloride will kill 99.99% of disease-causing germs when formulated properly. Products with benzalkonium chloride are perfect for technicians who prefer an alcohol-free solution. Ironically, alcohol-based products remove sebums and oils from the skin, drying out the skin after repeated uses. When the skin becomes dry, microscopic cracks and crevices occur and they become places where germs can remain trapped or hidden. Due to its brown color, provodone iodine isn’t used in instant hand sanitizers. In addition, if a technician uses a product with an active ingredient that does not have the broad strength to kill 99.99% of disease-causing germs, for example Triclosan-based products, then some germs remain and become resistant to the active agent. Currently, there are some identified organisms resistant to Triclosan-based products. Ultimately, if you do not kill the germs adequately each generation of germs becomes stronger and therefore has more resistance to the killing agents. This is how resistant organisms called “superbugs” are created. The situation is similar to using an antibiotic for only five out of the 10 prescribed days. Taking only half the dosage kills the weaker germs, but the stronger ones, while maybe knocked down, remain alive and viable. The stronger germs that remain are aware of the antibiotic and have become more resistant to it. Subsequently a larger dosage of medication is required to kill the germs or a different medicine must be prescribed. For example, methicillin-resistant Staphylococcus aureus or MRSA is a strain of staph aureus, a very common germ, that has mutated to become resistant to one of the strongest antibiotics known to medicine, methicillin. MRSA was the germ that made nail industry news a few years ago in central California after being found in foot spas in a nail salon that was not cleaning them properly. Many women who caught it at the salon suffered severe disfigurement on their legs. When I lecture to nail professionals, they are always amazed at how something so small can cause such disease, but also how fast germs can potentially grow. For example, one E. coli can turn into 140 trillion within 24 hours in an ideal environment that includes food, moisture, and warmth. So it’s imperative that technicians and clients properly use a strong killing agent. If antimicrobials kill 99.99% of germs, you are virtually guaranteed that there is nothing left to become resistant. It’s not just the hands that require proper antimicrobial sanitization. Use hospital-grade wipes or spray cleaner with a clean cloth to wash down the table. Technicians should do it in front of their client to show them how conscientious they are about cleanliness. It’s a great marketing opportunity. As the technician is sanitizing the table and her hands, she can explain that she cares about her customer’s health. This translates to instruments as well. All tools should be soaked in proper disinfection solutions, not just wiped off with a cloth. If there are germs on the tip of an instrument and the technician is pushing cuticles back, then the germs are directly deposited under the eponychium. Used instruments should not touch clean instruments. Think about how a dentist puts contaminated or infected instruments on a separate tray. Following these tips will help technicians and their clients remain healthy during flu season and beyond. It also provides an opportunity to showcase the cleanliness of a salon, turning it into a priceless marketing tool for today’s generation of nail professionals. Kenneth Gerenraich — also known as “Dr. G” — is a podiatrist and founder and CEO of Woodward Labs.